A Jhansi boy falls for a Kota girl, and stands up against his family to support her ambition, and eventually gets married to her. A well enacted movie about women empowerment and the need of men to accept and appreciate the caliber of women around them. Cleverly addresses the social stigmas and put them to scrutiny bravely. But it shy away from addressing a social stigma- STALKING, which was predominantly enacted by the male protagonist of the movie for a considerable time in the first half. The support staff was brilliant. 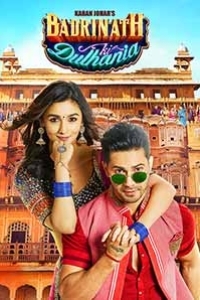 Loved the storyline as its funny and at the same time shows us some realities which we need to accept and change them asap.Loved the role of badri by varun dhawan and bubbly girl Alia bhatt. I loved watching it, great work done by Varun and Aliya! I love this couple's chemistry on screen. Worth a watch for all romantic movie fans!